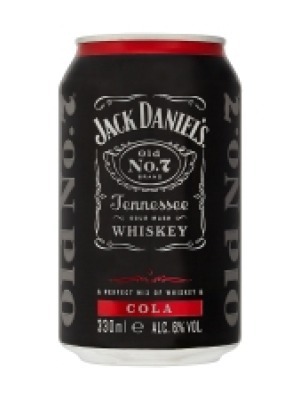 Jack Daniel's & Cola is a popular Pre Mixed Drinks available from DrinkSupermarket.com in 330ml to buy online. Visit DrinkSupermarket.com for the best price for 330ml of Jack Daniel's & Cola or compare prices on our other Pre Mixed Drinks products. Jack Damiels is the Original Tennessee Whiskey famous the world over. Pre-mixed with cola this is the perfect blend of drinks. Add a dash of lime to make the perfect Cuba Libre. 6% abv. Where to buy Jack Daniel's & Cola ? Jack Daniel's & Cola Supermarkets & Stockists. You can buy Jack Daniel's & Cola online in most retailers and find it in the Pre Mixed Drinks aisle in supermarkets but we found the best deals online for Jack Daniel's & Cola in DrinkSupermarket.com, Tesco Groceries, and others. Compare the current price of Jack Daniel's & Cola in 330ml size in the table of offers below. Simply click on the button to order Jack Daniel's & Cola online now.